A couple of weeks ago I mentioned that big changes are underway in my living room. Actually, I've been holding out on you. I've got news about my living room, and it's pretty stinking exciting. Ready? I'm in the middle of implementing a custom design from Darlene Weir of Fieldstone Hill Design. Somebody pinch me! I've never worked with an honest-to-goodness professional designer before, let alone someone of Darlene's caliber! Woo hoo! Right in the middle of procuring items for the room, though, I hit a snag. Darlene had found floor lamps that were just perfect for the back wall of my room. 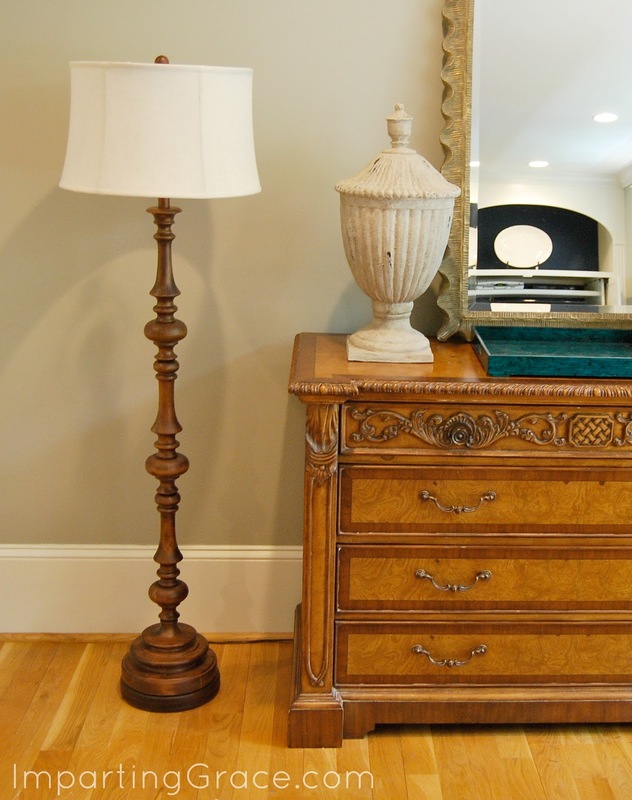 And she had found urns that were just perfect to stand on the chest beside the perfect floor lamps. 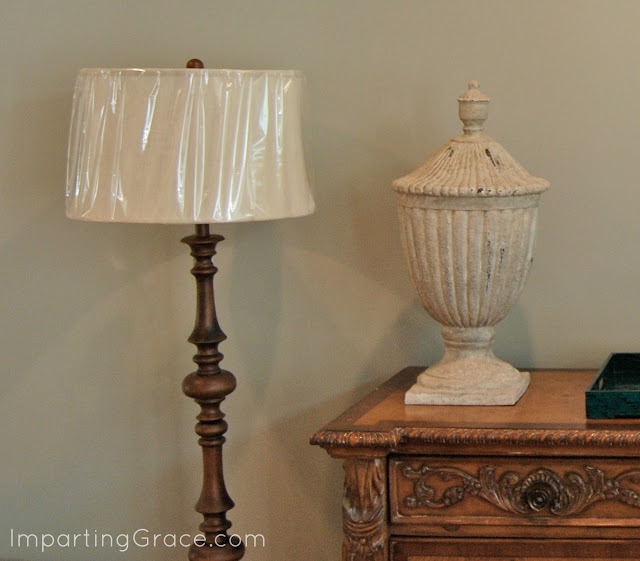 She told me that the urns and the lamps were going to provide "essential height variety." It was all going to be just perfect. It turns out that the lamps weren't quite as tall as they were expected to be. Instead of getting "essential height variety," we got elements of almost exactly the same height. I'm embarrassed to admit how panicky I felt when I looked at the wall. I really liked those lamps, and they were such a good price! I didn't want to search for different lamps. Other lamps were going to be much more expensive, I just knew it! And I loved the urns. I knew I wanted to use the urns. The urns were exactly what I wanted! Besides, returning them would be such a pain! My mind raced as I tried to figure out what to do. In short, I was in a tizzy. I emailed Darlene, who agreed that the lamps should be taller. Darlene wasn't at all panicky, though. She was very reassuring and suggested a couple of possible solutions. Which is to say that she reminded me that this was NO BIG DEAL. So I calmed down. Wooden bowls by Thomas O'Brien. Perfectly round, perfectly straight across, inexpensive. The light bulb came on as I realized that they were almost exactly the same circumference of the bases of my lamps. Could it be? and attached them, bottom side up, to the bottoms of my lamps. 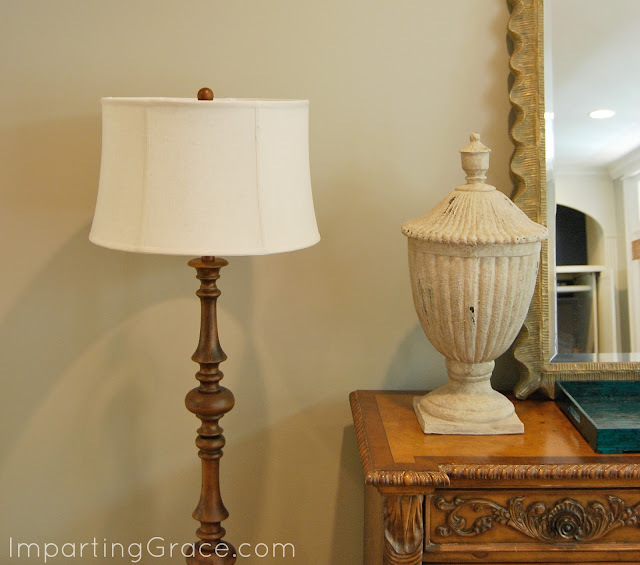 The bowls just sort of disappear under my lamps but make them an inch and a half taller. And that was that. End of drama. Problem solved. Want to see more of my new living room? My hope is to reveal the whole new room as soon as everything is in place, which I hope will be in the next couple of weeks. Now I find myself wondering if there might be simple solutions for more problems if I could just calm myself enough to see them. What do you think? I'm so glad you were able to find that easy solution! I have been (sort of) re-doing our living room too, although I don't have expert help like you do. I look forward to seeing your big reveal. Well, aren't you the smartest! Can't wait for the reveal. What a great solution, Richella! I do the same thing -- go wandering, first through the house, then the garage (hubby gets a little nervous when he see what mode I'm in) & lastly to the store. There is always an answer! I love Darlene! Can't wait to see the big reveal! Once the design elements are in place, it is the turn of the text and the other thing. Simply right click on the light bulb layer then "Copy Layer Style" then right click on your text and "Paste Layer Style". What a brilliant plan, can't wait to see more!!! I love simple solutions ... so glad this worked out for you. I love Fieldstone Hill design! It must be such a treat to be working with Darlene :). Can't wait to see how it turns out!